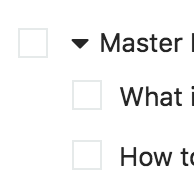 Each task can have its own list of subtasks. Subtasks are part of the task and always stay with the task. Since it is best practice in Marvin to keep tasks relatively short and to use projects for larger multi-step to-dos, subtasks are often used to serve as checklists for tasks. Subtasks can also be helpful when a task is a bit too large and unpleasant and you want to break it down into smaller steps so it is easier to get started on it. To add subtasks to a task, hover over the task and click the plus icon on the right. After you are done typing your subtask and press enter to save it, another subtask automatically gets created below it. If you press enter without typing anything, the empty subtask goes away. You can also click on the plus icon on a subtask to insert another one right below it. Subtasks can be reordered by drag and drop. Hovering over a subtask reveals a trash icon which can be used to delete the subtask. You can collapse/expand the subtasks by clicking the arrow on the left of the task title. It is important to understand the limitations of subtasks. Subtasks are not independent tasks and are always attached to a task. They can't have their own labels, time estimates etc. If you need this for your subtasks, use projects and regular tasks instead.